Hey guys we’re back! 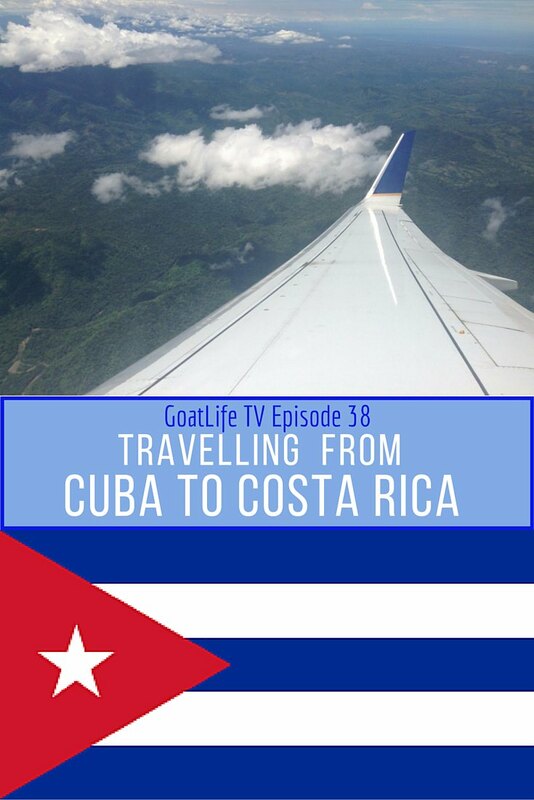 We’ve been away for 3 weeks in Cuba but now GoatLife TV is on again so keep tuning in every Wednesday. In this video we’re taking you along on our travel day flying from Havana, Cuba to San Jose, Costa Rica via Panama City. When we arrive in Costa Rica we rent a little car and cruise the coastline to our new home in Platanillo just outside of Dominical on the western coast of CR. We’ll be staying here for 2 weeks and next week we’ll show you around our cool little casita so stay tuned! I LOVE CR….you guys are in an awesome area too. The Pacific side of CR rocks; make sure you visit Manual Antonio, it’s magical. We lived in Quepos for the month and fed tiny titi monkeys from the front porch of our place, and heard howler monkeys on waking each morning. So pristine, SO much nature. Ahhh, it was Quepos that you were in, I was trying to remember 🙂 We really enjoyed our jungley area as well! Cheers and thanks for commenting Ryan. hmmmmm … well I want info on Cuba … I’d love to go and stay for a month or more ….